Sport murals will fit every football fan’s interior, no matter how old they may be. They will be a great solution for a boy’s room, which walls are dominated by posters of favourite football teams, as well as an adult man’s living room, where he can watch football matches together with his friends. Sport is a very important part of our life, that we pay more and more attention to - we make sure we eat healthy, we care for a balanced lifestyle and exercise, more than in the past. Sport wallpapers are a great idea for a decoration of our interior. They will remind us about daily exercise. A wide selection of designs makes it possible for everyone to find something for themselves. We can easily say that sport wallpapers refer to the ancient art. How? The ancient Greeks appreciated the benefits of sport on a massive scale. They’ve seen sport as one of the most crucial elements of human life. They were convinced, that spiritual and intellectual growth must go hand in hand with physical one. Only a harmonious development of the body can create a healthy and happy person. That’s why they would organise countless sports competitions, led by the Olympics. This cult of the body was also noticed by the artists of the time. Just like with sport murals, that depict modern athletes during exercise or competition with other players, the Greek artists would create breath-taking sculptures and vase paintings, that we can admire in countless museums all over the world. The cult of the body have gained a new meaning, and sports murals are a great proof of that. 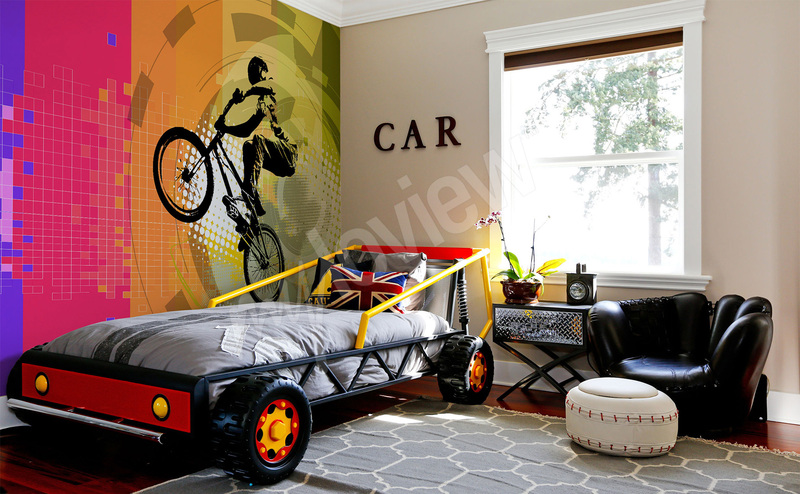 While deciding upon a given design of sport murals, it’s worth to pay attention to how it fits the decor of an interior. A properly selected depiction will not only be an aesthetic decoration. It can also make your interior gain a couple of metric squares, and it will become brighter or more energetic. It all depends on what kind of interior we have, and what are the effects we want to achieve. In an intimate room or living room, it’s worth to apply sport wallpapers with a three dimensionality effect. Athletes training in a sport stadium, or surrounded by nature, will give a sense of depth and will optically increase the size of the room. On the other hand, a dimly lit interior can be successfully brightened up with a sport mural with expressive, vibrant colors. Not only will they energise an interior, but they will also energise us and improve our mood. Modern interiors will be a perfect background for a minimalist sport wallpapers. An economical depiction of a ball, tennis racquet or a barbell with a bright, wooden background will introduce some of the sport character without disrupting the minimalist decor. And for the lovers of the extreme minimalism, we’ve prepared a sport wallpaper in form of simplified pictograms that represent a given sport discipline with help of couple of lines only. For industrial interiors, the best choice will be sport themed murals in form of artistic, black and white depiction of athletes. Sport themed murals will delight every teenager, no matter if they play any sports or love cheering their favourite football team. 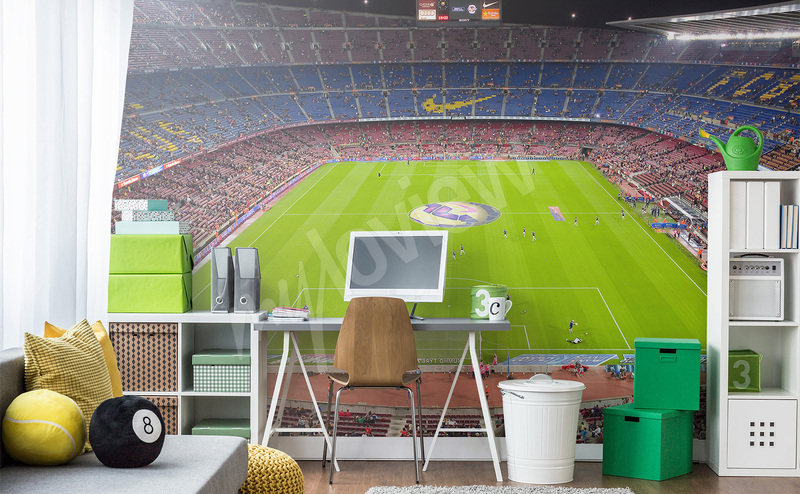 A boy’s room can be decorated by either a sport wallpaper with an illuminated sports stadium, where football players fight for a winning goal, or by minimalist close up on the green grass with white lines. A sport image will also be a great solution for an office decor. Sport themed murals with green grass or fragments of nature will make us feel more relaxed. It has been known for quite some time, that the color green helps us to calm down and relaxes our eyes. Moreover, sport themed murals with an image of training people will motivate us to get up from our desks, if just for two minutes, and preform a couple of simple exercises that will help us stay in shape.